Welcome to your new site. Click here to get started! There are four basic site types we suggest for academic use. Once you’ve decided on what sort of site you want, follow the easy setup instructions to get started. This is just a single page. Examples of how you might want to use it include posting your syllabus or CV, creating a page of important links, or advertising an event. This type of site is good for basic information. It has multiple pages and a navigation menu. A Basic Website works well as an instructional resources site, an organizational site, or a faculty or student website. This type of site is NOT what you want if students will be sharing their own work. For that, you will want a Full Website (see #4 below). This is good for keeping a journal of a trip, a research project, etc. Anything	where you are going to want to write short daily entries that users can browse through. The homepage will be a list of your latest posts or an alphabetical listing of posts. A Full Website combines the functionality of a Basic Website and a Basic Blog. It has static pages like a Welcome page and an about us page, but also allows for student posts. A Full Website is the best choice for a course website where the faculty member wants to have a homepage introducing the site to the class (and the outside world) but also uses posts to showcase student work. This is just a single page. It’s good for posting your syllabus, CV, important links, or to advertise an event. Not what you’re looking for? Go back to top of page. Click the “Customize” button at the top of the page. The Customize menu will appear to the left of this page. 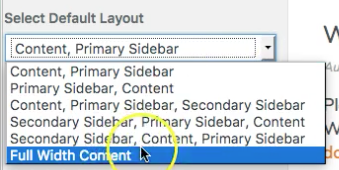 On the Customize menu, select Site Identity. Now click the arrow below the X at the top left to return to the Customize menu. Click Save and Publish and then click the arrow at the top left to return to the menu. Edit the page. You’re done! This is good for an informational site. Similar to a single page site above, but with a navigation menu to allow for multiple pages. It works as an instructional resources site, an organizational site, a faculty or student website, or more. While it’s fine for a course site for a faculty member to post information, it isn’t as good for a course site where students will be sharing their own work. For that, you will want a full website (jump to #4 below). Not the kind of site you’re looking for? Go back to top of page. This is good for keeping a journal of a trip, a research project, etc. Anything where you are going to want to write short daily entries that users can browse through. The homepage will be a list of your latest posts. Not the kind of site you’re looking for? Go back to top of page. Select “Widgets”from the left menu. Click “Save and Publish” at the top of the menu. That’s basically it. Click the X at the top left and just start creating posts and they will appear in date order with the latest posts first. A full website is a hybrid of a static website with pages like a Welcome page and an About Us page, but also allows for the addition of dynamic entries. A full site is usually best for a course website where the faculty member wants to have a homepage introducing the idea of the site to the class (and the outside world) but also uses posts to showcase student work. Not the kind of site you’re looking for? Go back to top of page. Click Save and Publish. Before you click the back arrow to return to the main menu, select “Front Page Displays: Your Latest Posts,” otherwise, you will lose this page of directions before you’re done.